Bagna Cauda was originally a very simple dish, often thrown together as a morning snack for Italian vineyard workers in midwinter. It has since moved into the realm of the home and has been spruced up by adding other vegetables such as, celery, artichokes, or mushrooms. In Alba, Italy, you might find it served with black truffles. Sometimes it is made with milk or butter and even with walnut oil. This sauce is served in a pot for everyone to dip their vegetables into, and kept warm by serving over a candle. Also serve the Bagna Cauda sauce with chunks of crusty bread and your favorite raw vegetables. This dip is fun for a party appetizer no matter where you live. Bagna Cauda, pronounced [BAHN-yah KOW-dah) is a specialty of Piedmont, Italy. When translated, it means, “warm sauce or hot bath. It was synonymous of good company, delicious food, and the season’s new wine. Now days it is considered a traditional part of the Christmas Eve buffet in homes throughout Italy. To properly make this recipe, the olive oil is gently warmed with garlic cloves and anchovies until the oil is scented, the garlic is softened, and the anchovies are dissolved. 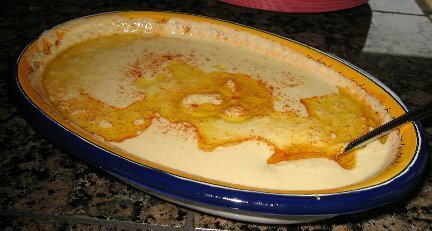 Please check out my Honey-Glazed Ham Easter dinner menu and Prime Rib Dinner Menu which includes this great Bagna Cauda as a before dinner appetizer. Wash and prepare the vegetables several hours before using them. Cut vegetable into strips about 3 inches long and 1/2-inch wide. Place all the vegetables in ice water to crisp. NOTE: Remember, this is a dip for vegetables freshly picked at the peak. Use only the youngest and sweetest variety of vegetables as possible. Before serving, pat all the vegetables dry with a towel. 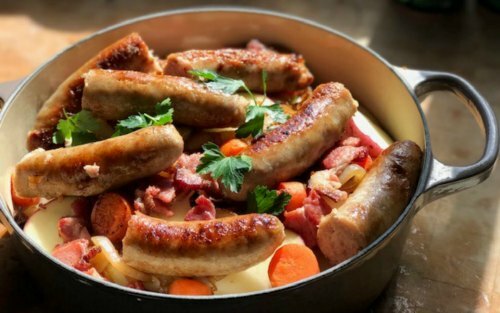 In a large heavy saucepan over medium-high heat, add cream and garlic cloves; bring just to a boil, lower heat to medium, and cook, stirring constantly, to prevent scorching or boiling over, approximately 15 minutes or until the cream has thickened and reduced by half (approximately 1 cup). Remove from heat and let cool slightly. In another saucepan, melt the butter (or olive oil). Mash anchovies with a fork and add to butter, along with cayenne pepper and parsley. Cook until the anchovies dissolves into a paste, about 5 minutes. Put the reduced cream, garlic cloves, and anchovy mixture into a blender and puree until the mixture is very smooth. The recipe may be made ahead to this point. In a saucepan, reheat the Bagna Cauda at a very slow simmer, stirring constantly, but do not let it boil. Serve in warming dish over candle (a fondue pot works well). If sauce begins to separate while standing, a few turns with a whisk will bring it back together. Sauce may be made ahead and kept refrigerated in covered jar. To re-warm, place jar in cold water in a pan and gently raise the heat until mixture is liquid again. How to Serve: Dip vegetables into the Bagna Cauda (a fondue-style fork will help), holding a piece of bread under the vegetable after dipping. After dipping a few pieces, the bread will be fragrant with oil and delicious to eat. Makes 6 to 8 servings (1 1/2 cups). * Use only good-quality Spanish or Portuguese anchovies. Anchovy paste may be substituted (approximately two inches squeezed from the tube will provide the equivalent taste of one anchovy fillet). More anchovy fillets may be added according to your personal taste.